Sometimes it’s really refreshing to step away from all the thinking and the books and just work with a material. I had these foam polystyrene pieces (the kind you put in packing boxes) that I decided to paper-mache into limb-like forms. I didn’t really have a plan or know what I was doing, I just wanted to get my hands dirty. I had to wrap them up in cling film first to create a more solid framework for the paper-mache to sit on and this was a very fiddly and frustrating process. 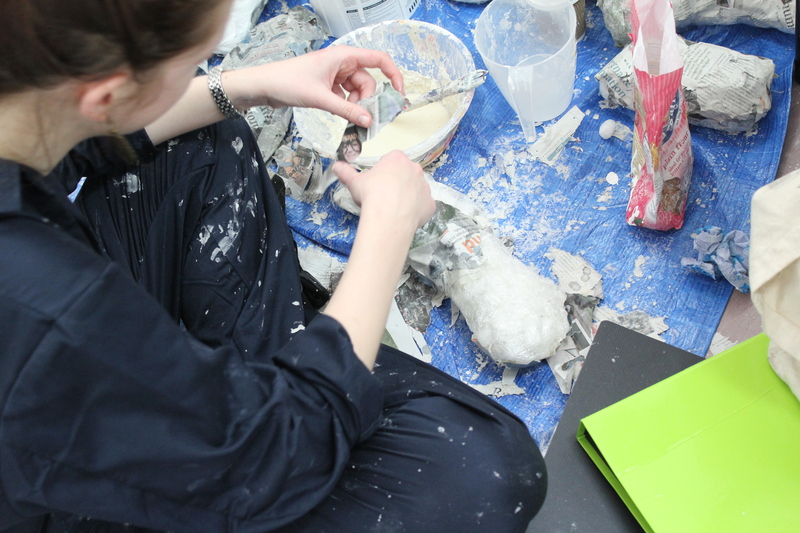 Despite this, it was great to be back in a boiler suit and sat in my studio making mess. So much of my work this year has been film, photography or performance documentation; essentially all digitally based, so it was a relief to make some physical objects and hold these items in my hands. I’ve enjoyed working in this way this year as Performance Art has been the direction my work has naturally taken. I never planned to go down the route of performance, but my will to push personal boundaries and explore the human body in ways I haven’t before has resulted in me drifting into the realm of performance. These limb-like objects eventually ended up being used in a performance piece. Initially this was not the plan, I had no idea where or what these would become. These days I always tend to have a rough notion of where an idea is going to go or how it will work out. It’s never perfect of course but having a rough outline gives me something to work towards. So in this case it was strange just making with no outcome in mind, yet it was also quite liberating. This liberation eventually turned into frustration however. These objects were so time consuming to make, especially with the drying time factored in, that I eventually lost interest. I think this was mostly due to the fact I had no direction and no idea to follow, so the objects became dormant. They ended up sat clustered in my studio for ages and eventually I started to develop a kind of resentful relationship towards them. Recently I had the impulse to use them as I couldn’t handle the idea of all those hours of labour going to waste. So I decided to incooperate them into a drawing-based performance. I was really glad it worked out this way, as it was interesting to go through such a journey with these objects. At first I was excited to create them, then the making process evolved from being therapeutic to a chore and finally I got fed up and found them to be useless. This period of uselessness lasted for ages, so it was incredibly satisfying to draw them back into another piece and find them to finally be useful and exciting again.